Are you searching for the best step tracker for seniors, but you’re too pressed for time to consider reading the entire buying guide offered by our researchers? Here is, in a nutshell, what you need to know. According to reviews, sales figures, and social media activity, the number one model you should focus on is the Fitbit Charge 2. With the help of this tracker, you will know how many calories you are burning every day, leaving nothing to chance. The heart rate zones make it easy for the user to see what exercise intensity their activity falls in. The Cardio Fitness Score displayed by the device will help you understand your fitness level so that you can decide what to do next to better your health. In case you cannot find this particular product anymore, the next one on our list of recommendations is the Realalt 3DTriSport. This device will track your heart rate so that you can better measure the calories you burn through the day. Apart from showing useful health information, the screen will also display information about your calls, texts, and calendar appointments. It also tracks your sleep and can be used as an alarm for a gentle wake-up. Buyers were not entirely satisfied with the accuracy of the heart-rate sensor. They reported it can be at least 15 beats off. The Fitbit Charge 2 is a great option for persons that love high-tech gadgets. The unit offers many useful features and it utilizes premium materials and the latest in smartwatch technology. This model uses the latest 3D Tri-Axis sensor technology to accurately track your every step. To ease up the setup process, you get a helpful user manual and some operation videos to guide you through successfully. You just need to clip it to your waist and let it do its job. As a plus, you also get a built-in clock and the ability to set step goals. Some buyers have reported that the tracker can sometimes turn itself off and they were unable to find a cause or a fix. The Realalt 3DtriSport is a highly-accurate tracker that will monitor your walking distance, calories you’ve burned, and your daily step goal, all on a very easy-to-read display. Similar to our previous model, this unit utilizes the same high-quality 3D Tri-Axis sensor for accurate measurement of your steps, distance traveled, and calories burned. The large LCD display is very easy to read thanks to the digits and letters that are very large. The unit is also quite small which makes it easy to conceal. A few owners have reported that on long walks, the device can randomly reset itself which can make you lose all the progress you’ve made. 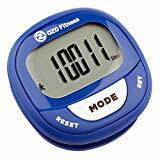 For elders that are keen on getting an affordable step tracker, it’s hard to get a product that offers a better quality to price ratio than the one offered by the wonderful OZO Fitness SC2. With so many step trackers for sale, it is hard to decide which one would be a good choice for someone in their senior years. We want to help you make a decision fast and without any complications. Take a look at the list below and choose the model that appeals to you most. Any of them can be the right one for you. Seniors need a step tracker that can be used all day long. The Fitbit Charge 2 is a good step tracker for seniors because it offers versatility and it is not only for people who like to exercise for hours every day. You will be able to keep track of how much physical activity you get every day, such as how many steps you walk, the total distance, how many calories you burn, how many floors you climb, and for how long you are active. All these numbers are not just for the sake of filling your head with the information you don’t necessarily need. A personalized Cardio Fitness Score will give you information on how you can improve your activities to become healthier. The heart rate zones will tell you when you are at an exercise intensity that is conducive to losing weight or which gives you a good workout. The device gives you essential information on your heart rate, as well. Tracking your activities daily can help you improve your fitness levels and lead a healthier life. 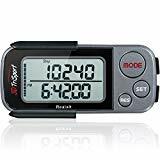 The Realalt 3DTriSport is considered a good pedometer for the elderly because it records the number of steps walked or run every day. The distances you walk or run are also registered and shown in both km and miles. You will be able to learn how many calories you burn, and how long you are exercising. Furthermore, to offer you the bigger picture of your activity levels and overall fitness, it records information and keeps it for 30 days. If you want to improve your fitness level and need a tracker to tell you where you stand, this simple pedometer is an excellent choice. The user manual is easy to understand and will give you all the information you need to use this particular device. The display is large and the characters used are easy to read, which makes it ideal for seniors. You can purchase senior exercise equipment for your home and start keeping up with a fitness regimen, but some activities do not need such investments. Walking and running are activities that will help you keep in shape, without the need for extra gear. However, you may want to take the OZO Fitness SC2 along with you, as it will give you information on the steps you walked or ran, the distance, the calories burned and so on. Always having feedback on your effort will help you keep up with your goals. Staying in shape as a senior becomes essential for a healthy life from one point onward. One of the nice aspects of this model is that it can be worn as a wristwatch. The device can store information for seven days, so you will be able to track your progress throughout an entire week without a glitch. Seniors need to have a certain level of physical activity every day so they can stay healthy. With age, the bones tend to become brittle and walking or running can help prevent the onset of bone conditions such as osteoporosis. Including some physical activity into your life will be less expensive than some osteoporosis treatments later on. With the help of this device, you can track your progress every day. This unit counts the number of steps you walk every day, as well as the distance walked. Even if you cannot get involved in physical activities that are more intense like running and doing sports, it would be good to walk every day. With the help of the OneTweak Pedometer for Walking, you will know the number of calories burned, and how long you walked every day. It retains information for the last 30 days, allowing you to check on your progress with great ease. When you are not in motion, the unit will hibernate, so you don’t have to remember to turn it off and on again. There is an important aspect that must be mentioned about this model, and that is its versatility. The unit does not only track your steps, but it knows to make a difference between regular steps and aerobic steps. Also, you don’t have to walk or run to have your steps counted. Even when you’re using a machine for training, this tracker will count your steps in any position possible. The device is lightweight, and it only has one ounce; you will be able to clip it anywhere you want, so you will not be bothered by it in any way. Its minimalist design should not fool you. This model is resistant to wear and tear, and its battery saving mode will prolong its lifespan. Make use of the large buttons that will offer you the possibility to reach the current day data with ease. You can check your progress by examining the data stored for the last 7 days. Even if you need to use senior walkers, that doesn’t mean that you should spend your days cooped up at home. Do something for your health and take small walks every day, as they will do wonders for your health and your morale. The Letsfit Fitness Tracker is one device you may need to track your physical activity day by day. This machine records everything you do in a day. How many steps you walk, how far you walk, how many calories you burn, and how much time you spend every day being active, are all retained in the memory of the device for 7 days, which will allow you to track your progress. The device is also a smartwatch so that you don’t lose any important calls or SMS notifications, and that without having to check your phone all the time. The USB plug makes it easy to charge, and a single charge will last for 7 days. As we advance in age, it can become harder and harder for us to keep in shape, and include enough physical activity every day. However, if you have a device like the Omron Hj-113 by your side, you will find it easier to get the motivation needed for staying in shape. This tracker is capable of counting the number of steps you want every day, as well as the number of aerobic or healthy steps, which are those executed a bit more energetically, to help your heart rate increase a bit. You will know how many calories you’re burning every day, as well as the amount of fat you’re getting rid of. There is hardly a better solution for finding the right motivation than by seeing the advances you make every day. You can use the device by putting it in your pocket or a bag. It also comes with a clip so that you can attach it to your belt. Needing a walking stick to see about your day should not prevent you from taking at least short walks every day. Keeping track of all your activity can be hard when faced with such challenges, but you should not give up. The Omron HJ-320 Tri-Axis is a suitable tracker for seniors that will keep you motivated to get enough physical activity every day. The smart sensor installed on the device will make sure to present you with accurate information, and it will even count the steps you make in other positions than vertical if you are using a fitness machine. The machine resets every day, at midnight, so that it can present you with accurate information for the new day that begins. You will be able to store data for seven days consecutively, which will, in turn, allow you to track your progress with maximum efficiency and accuracy. Becoming and staying healthy should be a goal for everyone, and seniors are often advised to try to keep a regular level of physical activity every day. A device like the ACCUSPLIT AE120XL can offer the means to keep track of your steps, either walked or jogged, for a healthier life. This model can count up to 100,000 steps, so its performance is guaranteed. The case that covers the step tracker will prevent you from resetting the machine by accident. You will love the large display that offers information in easy-to-read characters. The safety leash won’t let you drop the pedometer by accident. Being able to track the number of steps you walk every day will motivate you to sustain the necessary levels of activity to become healthier. The overall accuracy and performance of this particular model will convince you that it is an excellent choice for you. This smartwatch is an excellent device that can keep track of your heart rate, how well you sleep, and the level of physical activity you engage in every day. There are several reasons why this model is better than others you can find on the market. For instance, you can store more than 300 songs on your smartwatch so that you don’t have to use your phone. The more than 15 exercise modes available also come in handy for people who like to be more active. You can even take this model to the swimming pool, as it resists immersion. The personalized coaching offered via your Fitbit will motivate you to stay in shape. You can receive calls, app notifications, and access the favorite applications for weather and sports, among other things. The battery lasts for more than four days, so you will not have to recharge it too often. Seniors need to have their health monitored on a regular basis, and that is extremely important as early signs, or symptoms of a disease can help healthcare professionals find the adequate treatment in a timely fashion. To stay healthy, seniors need to get more physical activities in their schedule, and, while doing so, it would not be a bad idea at all to have a device that tracks their progress. Such a device is a step tracker whose primary role is to count the number of steps the user walks every day. The models on the market, however, are more sophisticated than that, and that is why we put together this guide on how to find the best pedometer for seniors. A step tracker does precisely what the name indicates: it tracks the steps you walk or run. However, since we are talking about models for seniors here, we need to focus on other aspects, too. For instance, is the model you intend to buy a good option for a senior? What does it do to help a person achieve better health? Some, more advanced models, are also excellent heart rate monitors. They give the user an idea on the intensity of their workouts and can serve as a starting point for improving one’s health. All the senior step trackers reviews agree that you should opt for a model with more functions than just the basics. The best models will track the distance and time you walk or run, and will also show you how many calories you burned. This can provide you with the much-needed motivation to go out every day and walk a little so that you can keep in shape. Seniors need devices that are easy to use. A blood pressure bracelet serves for letting the user know when changes appear, but a step tracker is a bit different. Some come in the shape of a bracelet, just like the device we mentioned earlier, others can be carried in a bag, while others are veritable smartwatches. This type of device must be easy to use. For instance, a pedometer that caters to seniors must have large buttons that quickly bring forward the information needed. Even the cheap senior step trackers should have such features, as they are essential for a pleasant experience. The display must show the data in easy-to-see characters. There is no point in having a step tracker if the device is not capable of showing you the progress you’ve managed over the last days. Automatic reset is, of course, a nice feature to have in a pedometer, but you also need to see the results for the previous days, as well, so that you can make a comparison. Keeping in mind to write down the numbers every day can be a hassle. A senior already has plenty of things to remember from taking blood pressure lowering supplements to taking other medication or performing other tasks. So, it would be nice for the step tracker he or she uses to come with the ability to store the information gathered for the last days, at least. Some models offer information stored for the previous 7 days, while others can even save information like that for 30 days. Keeping track of your progress is essential. Especially units that can tell you how many miles you walked, or how many calories you burned, will help you find the motivation to keep up with a certain level of physical activity so that you can maintain yourself healthy and happy. If you intend to find some great granddad gifts, and you are not decided what to buy, a pedometer would be an excellent idea. However, before you pick a model, consider this last piece of advice: get a model with a long battery life. As expected, models that come with extra functionalities, like a smartwatch, will have their battery charge depleted faster than simple models. Aim for at least four days of battery life on one charge, so that using the device doesn’t become a nuisance for your elderly relative.